I read quite a bit - I was chatting with a colleague a few days ago where he asked how many books I read a year, and when I looked at my reading history, it turns out that I read about 20 books a year, or almost two books per month. Anyway, I have decided that I would read at least one thick book every year, and for this year, Shahnameh would be it. Shahnameh is an epic, which is remarkable in several aspects. It is the national epic of Greater Iran. 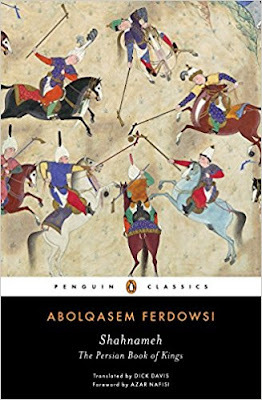 Written by Abolqasem Ferdowsi, it is also the longest epic written by a single writer. Shahnameh is the Persian book of kings, and as such, narrates the stories of the kings of Persia from the mythical period to the end of the Sasanid Empire. Upon reading this, I felt like the contents allowed me to have a slightly deeper understanding of Persian culture. It was also interesting to see how views of monarchy were back in the 10th century, when this poem was written. See, nowadays, most people do not have a monarchy anymore, at least of the absolute kind. Most monarchies nowadays that are still around are constitutional monarchies, where the king or queen is just a representative or a symbol of the state. The entity who has actual power is the Prime Minister, someone who is chosen by the people, in one way or another. Back then, this was not the case. Back then, the right to rule is signified by your birth. If your father was a king and he was just, chances are you would also be just and therefore you would also be the one who should be king. Additionally, kings get divine approval back then. In Shahnameh, there is the concept of farr which to my understanding is some sort of halo. This halo signifies how you're divinely assigned to be a ruler or not. If you are a just and righteous king, then your halo is bright, but if you start entertaining evil ways, then it slowly dims down. People can see this halo, and is an indication of who should be the rightful king or not. There were other cultural issues that differ, such as the way women are handled for example. Ancient Iran was a very patriarchal and male-dominated society (in some ways modern Iran still is). Women are treated as property, and there are very few instances of female rulers. Comparing to the modern ideal society, the society back then still had a lot of learn. In any case, this was a very interesting book to read. It was a massive and very complex narrative, and unlike other epic poems, there is no single hero or main character here. In Shahnameh the main characters come and go. It is more a historical narrative with mythical aspects, narrated chronologically, so when the main character of the day dies, another one comes to take his place. I give this book 4 out of 5 stars. Read this book if you have a special interest in Persian culture.